We help all students using federal and state veterans education benefits. We walk current and prospective students through the benefits application and certification process, provide veteran-centered academic support, career services, health care and wellness resources and support the ongoing success of veterans on campus. Sharing our expert knowledge of federal and state veterans education benefits is a priority of our office, along with connecting students to grants and scholarships specific to our campus. We help student veterans develop their resumes, and connect them to internships and employers. Our team offers free tutoring, academic counseling, peer coaching and mentoring both in our office and employing student veteran tutors in the Sanger Learning Center and in the Undergraduate Writing Center. We have an on-site, full time Veteran Affairs counselor who specializes in counseling for post-traumatic stress disorder, depression, sleep problems and anxiety. Our counselor also helps with VA healthcare enrollment, disability documentation for accommodations and coordinating medical and mental health care at local VA facilities. In the military, we all recognized that we were only as strong as the community and support we have around us. 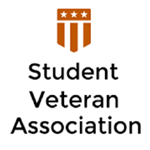 We connect students to campus opportunities, the Student Veteran Association and the Veteran Advisor Council. Be a part of our thriving veteran community.